Obviously tanking legs for druids, and they aren't horribly expensive to make. An easily obtainable stopgap until you can get these are the Ash Tempered Legguards. I want to make these for a guildy that doesn't do LWing. Does the "Requires Leatherworking (350)" apply to using the item or just to getting the set bonus? do you have to be a leatherworker to wear this set? So will the stats auto change if you have them already or will you have to remake these? That would be a bummer. the armor value is not 503, it is 251. i don't know why it is listed at 503. I had these crafted for my bear on Bonechewer the other day. All in all, mats cost about 150g (not incl. 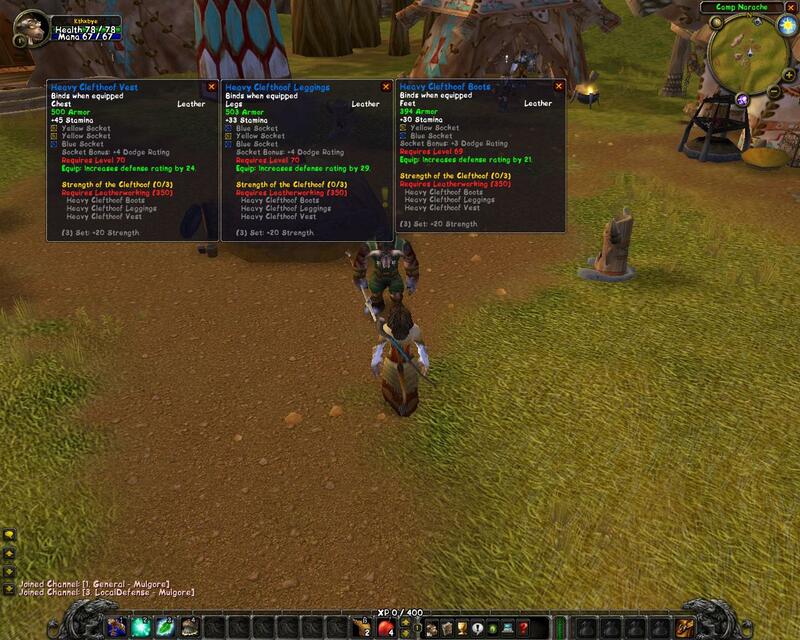 the primals which I had from mining), and my crafter didn't charge me for the crafting service (I left him 15g). Slapped a Clefthide Leg Armor on them right away (as mentioned above). Anyway, just a comment on the socketing of the Heavy Clefthoof set. If you forgo the socket bonus and instead socket all of the sockets in the Heavy Clefthoof set with Thick Dawnstones (+8 defense rating, http://www.wowhead.com/?item=24052), the Heavy Clefthoof set will provide you with a total of 138 defense rating. At that point, any number of items will provide you with that last boost that you need to get to 156 and crit "immunity". (Consult a drood game mechanics page on that one. Some conditions do apply, i.e., you'll have to have 3/3 SotF.) Fr'instance, the third level Violet Signet gives 18 defense rating (http://www.wowhead.com/?item=29278). Heck, even the rather easily-obtained ring from Durnholde (http://www.wowhead.com/?item=27436) will give you a solid 17 (which lands you at 155). And let's not forget about shoulder enchants (although those aligned with Aldor you will have to be exalted to get an enchant with defense rating on it). Just a thought for droods who want to reach 156 ASAP with the fewest pieces of equipment. Personally, I like having the freedom to spend item points on other gear on other stats. reason the boots are so cheap, is because leatherworkers use them to level on, what makes the parts so exspensive is the thick clefthoof leather, if your a leatherworker i suggest you farm that your self at the Clefthoof bulls in Nagrad. Sadly, after Patch 3.0, these, along with many other high level Leatherworking patterns, have had the armor value reduced greatly. I was wearing these, the chest of the set, and the Boots Of Natural Grace, and i had roughly 26k Armor. After the patch, ive lost about 5k. Alas, these are now pretty rubbish for druid tanks. I have switched to using most of my PvP gear for tanking as it has much better stats than these. wowhead's own item comparison tool now rate these just below Dragonhide Legguards for bear tanks. These arent as good as the Dragonhide Legguards, but if your a bear tank and still need Def to hit the cap, this is still the eaisest way to go imo. As much as i want to replace them, without them i wont have defense capped. I still prefer to wear these for the sockets. (3) Set : +20 Strength.